For many dairy farmers, 2009 was a difficult winter in many parts of the country. Snow in December, along with additional storms and extreme cold temperatures, left dairy farmers numerous obstacles to deal with. One of those obstacles is hoof care and lameness. All too often lameness is an underlying issue robbing dairy farmers of profits. It is estimated that every lame cow on a dairy farm costs between $300 and $400 due to lost production, decreased reproductive efficiency and cost of treatment. 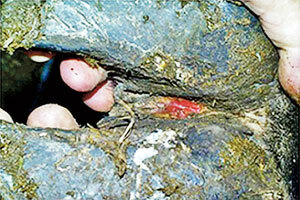 Research by Dr. Nigel Cook at the University of Wisconsin – Madison showed that January, February and March are the months where lameness caused by infectious lesions is most prevalent (Figure 1). Dr. Cook tracked lameness in ten Wisconsin dairy herds for a 12-month period. There’s an old saying in horse racing circles. “No hoof, no horse.” It refers to the simple truth that even the fastest, strongest and most well-bred colt can’t run if he’s not sound. Dairy cows aren’t runners or even particularly athletic, but the same phrase could easily be modified to “No foot, no cow” to describe the impact lameness has on dairy cattle performance. Although that wouldn’t be completely accurate because lameness can hobble bulls too, adding them to the list of “physically unable to perform” animals.